You know what? Just because you’re a dude, doesn’t mean you can’t enjoy a pedicure just like your female counterparts. Pedicures don’t see gender or sexuality. Pedicures are for everyone. I understand that a nail salon might feel like unfamiliar territory. They play soap operas and serve bad wine (the good ones do, at least) and the decor often relies heavily on silk flowers and hologram paintings. They also tend to be completely full of women and the last decade’s worth of Us Weekly’s. You might feel like you’re behind enemy lines, but you’re not! It’s all in your head. You will be welcomed into a nail salon with open arms. Business is business. Plus, you’re going to like it. What’s not to like about someone rubbing your feet and making them look nice? It is a very simple pleasure. One that helps you put your best foot forward, if you know what I mean. Besides, your feet could probably use some maintenance. Especially in this time of year, when your feet are out on parade. (Going to the beach and the pool and at the bbq out in your yard are appropriate places to wear sandals, by the way.) The point is that people are looking at your feet and you do not want to hit up the annual block party with a case of troll foot. No one’s letting you cannonball into their new above ground pool with troll foot, either. Don’t even think about about coming to your boy’s Fourth of July bash with the nasty troll foot. Go get a pedicure! I did a quick poll of the dudes on Deadspin staff to see if anyone had ever gotten a pedicure. No one had, but they all seemed pretty willing to go. One day, I’ll probably hold them to it. And they’ll like it, I have no doubt. Meanwhile, there is another area blogger I know to get pedicures from time to time: Gawker’s Sam Biddle. He’s not the only dude I’ve gotten a pedicure with, either. My brother will go occasionally, as will a few other friends. I see men getting pedicures all the time, too. They all dig seem to dig it in equal measure. Understandably so. You’re relaxing in a spa chair for about 45 minutes. That’s something men and women can agree is great. How do you get a pedicure? Walk into a neighborhood salon and tell them you want a pedicure. (To be clear, I’m not suggesting you paint up your toes with fire engine red nail polish. Unless that’s your thing. In which case, go for it!) You’re doing the whole pedicure thing, sans polish and for general foot health and maintenance. If there’s a wait, it won’t be much longer than 10-15 minutes. The manicurist will direct you to a chair, and get you set up. They’ll fill the tub of the chair with water, and you’ll soak your feet. Then, the manicurist will scrub your feet, slough off the dead skin, and work out the calluses. 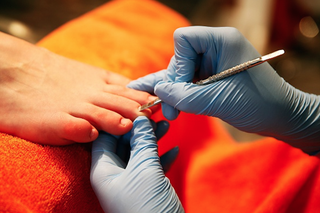 If you’re ticklish, the scrubbing part might be a little bit harrowing for you, but it’s likely nothing a manicurist hasn’t already dealt with before. He or she might put a mask on your feet, too. Then comes the best part: the massage. This is the good stuff. (Treat yourself and all that!) After that, to round things out and make your feet look nice, the technician will buff your toes and smooth out your cuticles. Then you’re all set. For a really good pedicure, you’ll spend anywhere between 25 and 50 bucks, depending on whether you’re getting just a basic pedicure or adding any extras like additional massage time. Oh, and when you settle up, please tip your technician well. Twenty percent is a good rule of thumb. A pedicure is a gateway drug. You’re going to enjoy it and maybe you’ll make a habit out of getting pedicures. You may even decide you want to get a manicure, too! You put the man in manicure, you know. When you look good, even all the way down to your feet, you’re going to feel better. Most importantly, there’s no shame in wanting to take care of yourself. It’s encouraged really.